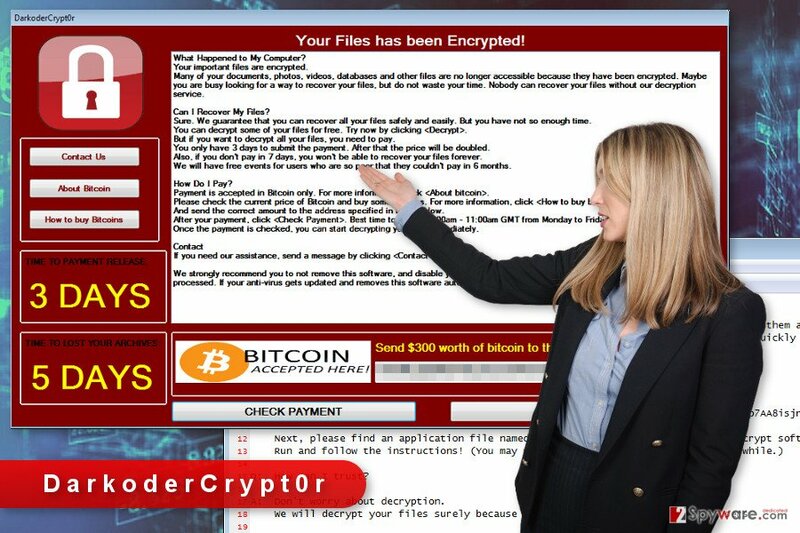 DarkoderCrypt0r ransomware uses sophisticated techniques to infiltrate computers and hide from its victims. Use Reimage to determine whether your system is infected and prevent the loss of your files. 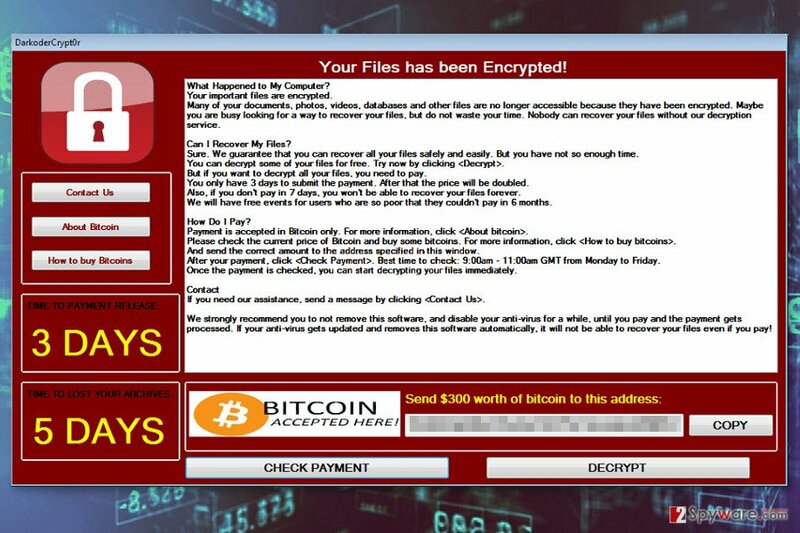 DarkoderCrypt0r is an in-dev version of the WannaCry ransomware. This file-encrypting virus uses AES-128 encryption algorithm and appends .DARKCRY file extension to each of the targeted document, audio, video, text, and other files. Malware works silently and encodes files immediately. Once this hazardous task is completed, it triggers a pop-up window where cyber criminals provide instructions how to recover encrypted files. The ransom-demanding message informs that users need to transfer $300 in Bitcoins to the provided address. Crooks give three days to make the payment. Otherwise, the size of the ransom will double. However, of victims decide not to pay the ransom at all, they are supposed to lose their files forever. Such statements are nothing else than blackmailing strategy and psychological terror. Hackers standing behind DarkoderCryptor want to scare victims into paying the ransom. Following crooks’ orders is a risky and not recommended task. They may not provide the necessary decryption software or ask to pay even more money. We want to remind that this virus is still under development. Thus, cyber criminals may find new ways how to cause you more damage. For this reason, you should not think about encrypted files and focus on DarkoderCrypt0r removal. Ransomware elimination is performed using antivirus or anti-malware program. 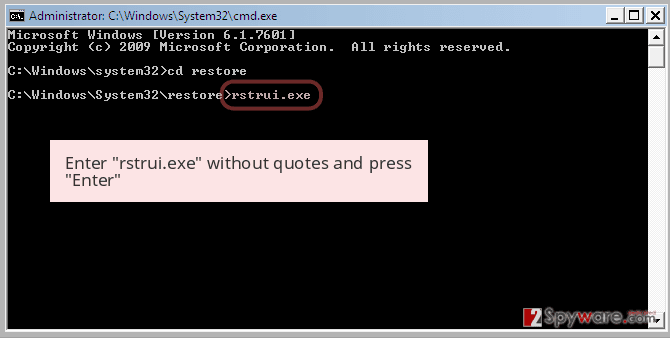 Thus, install Reimage or your preferred program and get rid of malware ASAP. In the ransom note, cyber criminals tell that it’s impossible to restore files encrypted by the DarkoderCrypt0r virus using other third-party software. Unfortunately, it’s true. However, malware researchers and security experts are working on secure decryption software that would help victims of ransomware. Currently, data encryption is impossible without a unique key. Obtaining it from the cyber criminals is not recommended because you might end up with money loss or other malware attack. Ransomware-type viruses are often capable of opening the backdoor to malware or installing some malicious programs itself. Viruses that belong to this WannaCry family are known of capable of doing such damage. Thus, if you have just found out that DarkoderCrypt0r was installed on your computer, you should act quickly. Instead of paying the ransom, take care of your computer’s security and get rid of the ransomware. Once you remove the virus, you could look up for safe data recovery options. DarkoderCrypt0r ransomware demands to pay $300 in Bitcoins within three days time in order to decrypt files. Originally, WannaCry ransomware exploits Windows OS CVE-2017-0145 vulnerability. This distribution method allowed malware to launch enormous attacks because lots of people are using old and outdated versions of the operating system. Thus, DarkoderCrypt0r might also be using the same infiltration strategy. 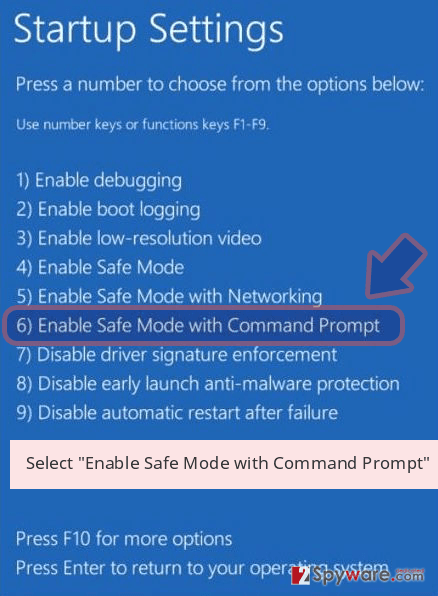 Users who have computers running Windows 10 should not encounter this malware. However, the ransomware might also be spreading via malicious email attachments. Thus, if a user clicks on an infected document attached in the email, malware might infect the device with the latest operating system as well. However, the main target field is old and outdated OS and software users. For this reason, cyber security specialists suggest installing MS17-010 system security update for Windows OS and other available system and software updates in order to avoid DarkoderCrypt0r ransomware. Ransomware elimination requires installing the reputable malware removal program and running a full system scan with it. We highly recommend performing DarkoderCrypt0r removal using one of these programs: Reimage, Malwarebytes MalwarebytesCombo Cleaner or Plumbytes Anti-MalwareMalwarebytes Malwarebytes. However, installation of security program might be complicated. This crypto-malware might prevent you from doing that. 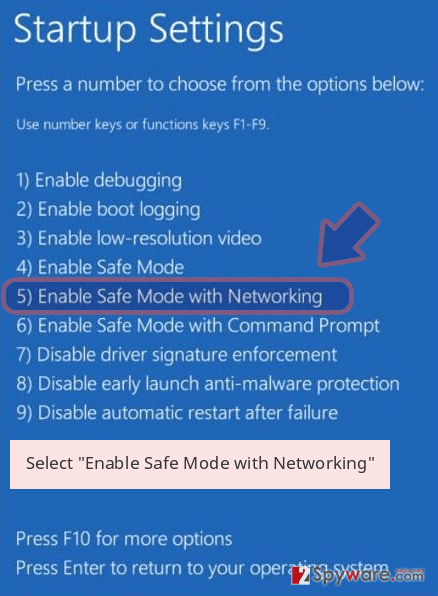 Thus, you may need to reboot the computer to the Safe Mode with Networking.This mode helps to disable the virus and install or update your chosen security program. Once you remove DarkoderCrypt0r from the device, you can plug in external storage with backups and restore encrypted files. Currently, it’s the only effective data recovery option. 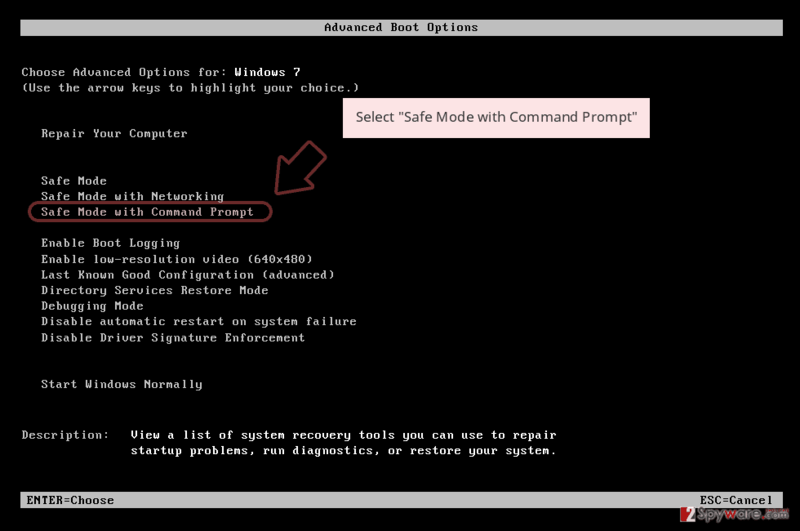 However, if you do not have backups, you should try our presented alternative methods below. 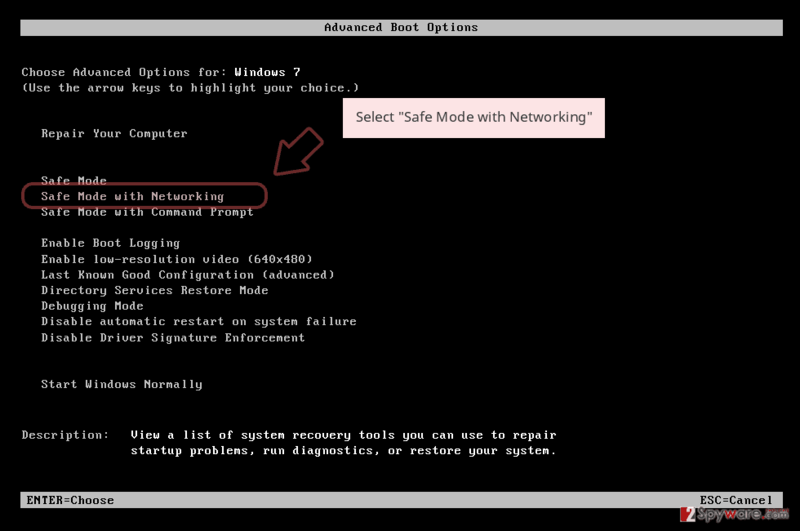 If you cannot install security software for DarkoderCrypt0r removal, follow the steps below to reboot the computer to the Safe Mode with Networking. Log in to your infected account and start the browser. Download Reimage or other legitimate anti-spyware program. Update it before a full system scan and remove malicious files that belong to your ransomware and complete DarkoderCrypt0r removal. Follow the instructions on how to disable the virus and install malware removal program. When a new window shows up, click Next and select your restore point that is prior the infiltration of DarkoderCrypt0r. After doing that, click Next. 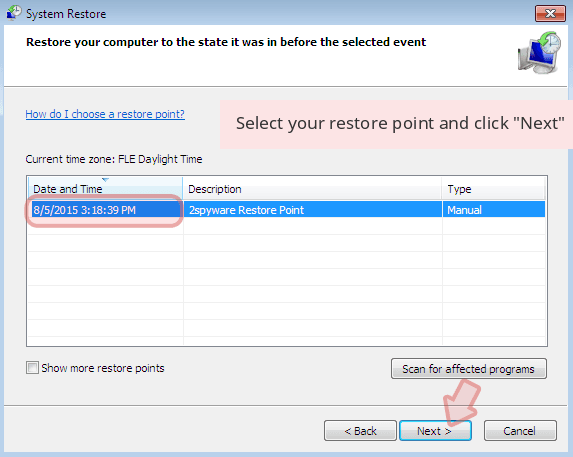 Once you restore your system to a previous date, download and scan your computer with Reimage and make sure that DarkoderCrypt0r removal is performed successfully. Guide which is presented above is supposed to help you remove DarkoderCrypt0r from your computer. To recover your encrypted files, we recommend using a detailed guide prepared by 2-spyware.com security experts. Data backups are the only possible data recovery solution at the moment. If you do not have them, please try alternative recovery methods. However, you should not expect to get back all of the damaged files. If you do not have backups, Data Recovery Pro might help you to restore some of the files encrypted by DarkoderCrypt0r ransomware. 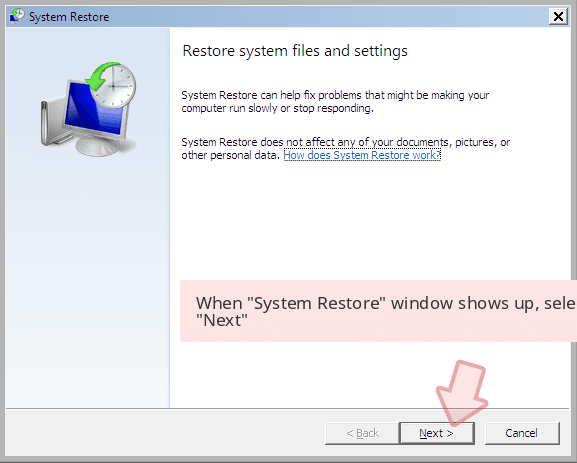 If System Restore function has been enabled before ransomware attack, you should take advantage of Windows Previous Versions feature. It’s still unknown whether DarkoderCrypt0r deletes Shadow Volume Copies of the targeted files or not. Malware is still under development, so it might fail to delete them. Thus, in this case, ShadowExplorer is useful for you. DarkoderCrypt0r decryptor is not available yet. ^ WannaCrypt ransomware worm targets out-of-date systems. Microsoft TechNet blogs. Microsoft Malware Protection Center blog. ^ Bogdan Popa. Windows 10 Users Protected Against WannaCry Ransomware Attacks. Softpedia. Free Downloads Encyclopedia and latest industry news. This entry was posted on 2017-05-16 at 03:07 and is filed under Ransomware, Viruses. You can quickly scan the QR code with your mobile device and have DarkoderCrypt0r ransomware virus manual removal instructions right in your pocket. How did you remove DarkoderCrypt0r virus?